Useful, informative, and very pretty! These large (40x29.5cm), high quality lens cloths for your glasses or goggles show 3-D panorama maps of ski slopes above popular European holiday resorts. The cloth does not get soggy in the snow, tear or need refolding. It is highly durable, clear and easy to read and handle with gloves. When required, it can be washed at 30º. Most titles have maps printed on both sides of the cloth. 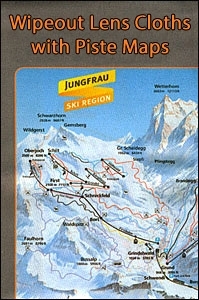 The maps provide a very vivid picture of the mountains, highlighting ski routes and the connecting ski lifts or other transport. 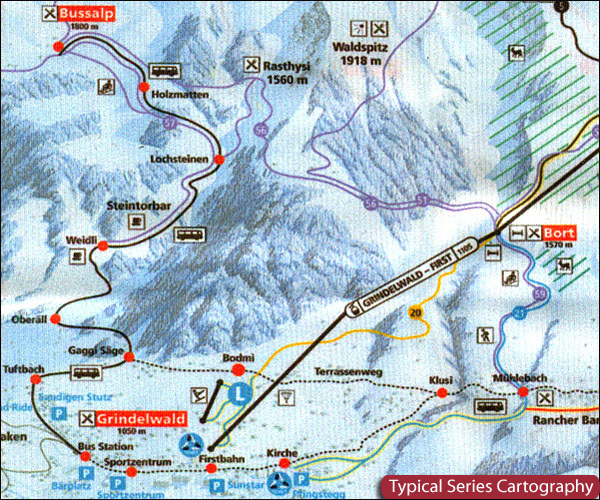 Some titles also show various tourist facilities such as huts and restaurants, playground areas for children, etc. Ideal for planning your trip in advance, the Wipeout cloths also makes a great souvenir, plus can be used on any screen at home: TV, PC or even the windscreen.